← Do You Know Corrie & Jeff McPherson? Rudy is a “homegrown San Antonian” — born and raised here. He’s lived in various areas in and around the city, and eventually settled in Lavaca fourteen years ago. Rudy joined the Air Force when he finished school and served for four years. After his service he had a few jobs — in sales and working for the SA Police Department in the Radio Shop — before he began his career in civil service. His last civil service position was as a Procurement Analyst at Kelly Air Force base, and he retired from there in 1990. It wasn’t until he retired, however, that he focused on his true passion — music. He had never played an instrument and decided that it was time to learn. He took lessons from Toby Torres at the Guadalupe Cultural Arts Center and learned to play the bajo sexto. Texas Folklife Resources gave him a grant to further study bajo sexto and he became a resident artist for the Texas Commission of the Arts. During that residency, he started a Conjunto program at the Teatro de Artes de Juan Seguin. In 2002, Rudy and a few other local musicians formed the Conjunto Heritage Taller (CHT) here in Lavaca. Located on S. Presa Street, the organization’s mission is to perpetuate Conjunto music… to teach it at a very affordable price. It is a 501( c ) 3 organization and provides lessons to students who range in age from 7 to 70. Rudy describes Conjunto music as “European music with chilipitin flavor” — that is, ‘spiced-up’ European music. It’s more than concert music.. it’s dancing music. He loves to teach his craft as well as educate people about it, and explains that when Europeans came to Texas, they brought their accordions. After long days of physical labor, they’d bring out their accordions to relax. Locals would join them, pulling out their guitars to jam with the European accordionists. The combination was magical, and that was the start of Conjunto music. It’s since become very popular and it is very much the signature sound of this part of Texas. This year, CHT is celebrating its 10th anniversary and hosting Tardeada (which means “late afternoon event”) this Saturday at La Villita’s Maverick Plaza. The performance will showcase CHT students and some of its Conjunto music legends, and raise funds so it can keep student fees affordable. Rudy is disappointed that the Annual International Accordion Festival (an October event in La Villita) was canceled this year. He hopes that the Tardeada concert can help fill the void, and looks forward to the return of the Festival in 2013. Rudy and his wife Vera were married in 1965. They built their home on Camargo Street fourteen years ago and have been living in Lavaca since. They share their home with Ting and Frida — their four-legged family members. They have two daughters and three grandchildren. Their older daughter lives with her husband here in San Antonio. Their younger daughter lives with her husband and three children in Dallas. Rudy is a ‘micro-rancher’ and describes himself as an ‘outdoors man’. He has property out of town that’s affectionately referred to as his ‘sand-box’ because that’s where he goes to play. There’s a pond on the property, and ponies, and Rudy’s been known to bring inner-city children out there to fish and ride the ponies. Rudy enjoys the Lavaca & Friends Happy Hour at La Frite. 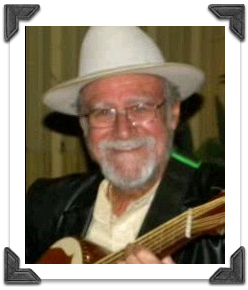 Say hello the next time you see him there, and head on over to Tardeada this Saturday to support the Conjunto Heritage Taller and experience the best Conjunto music in Texas! Originally published October 10, 2012, in the Lavaca & Friends Happy Hour update.